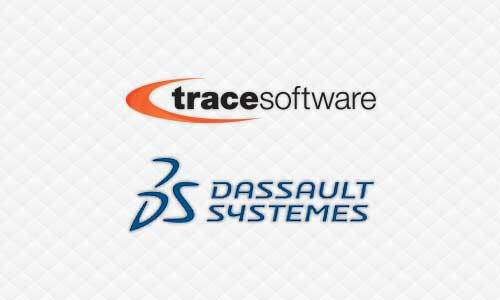 Saint Romain de Colbosc, France – Aug. 1st, 2012 — By this agreement signed with Trace Software International, DS SolidWorks, a world leader in 3D solutions adds a new specialty to its portfolio of products. Elecworks™, electrical CAD software developed by Trace Software International and SolidWorks Gold Certified product since 2010, will be sold as SolidWorks Electrical. Both electrical and mechanical designs can proceed simultaneously with real-time data sharing. The 3D implementation allows early identification of the need for adjustments in a project and the prevention of component collision. Thanks to the 3D automated wiring feature, SolidWorks Electrical simplifies the wiring process: 3D panel or machine wiring is carried out automatically using the shortest possible appropriate route, providing precise wire length calculations. This process can also be applied to harness design for the embedded industry. Electrical component management is achieved through an advanced integration within SolidWorks Enterprise PDM. Since elecworks™ launch in 2009, customers have commented about its friendliness, its no-learning curve and its time-saving tools: undo / redo command, smart copy-paste of repetitive drawing parts, smooth project navigation… It also provides electrical engineers with specific dedicated tools: cable synoptic for a project preview, single-line and multi-wire drawing integration, automated generation of PLCs drawings, connection label insertion to locate all connection information for a device in a single glance, automatic generation of harness flatten route view, highly realistic 3D wire view showing separate wires in a duct, etc. It also has another special time-saving feature: a direct access to TracePartsOnline.net* portal to download “smart” electrical components. These components are able to auto-position themselves on DIN rails and are supplied with previously defined connection points used for the automatic component wiring. Trace Software International continues elecworks sales and development reinforced with new comer offer SolidWorks Electrical by SolidWorks VARs. DS SolidWorks will initially sell SolidWorks Electrical through selected SolidWorks VARs in specific geographic areas such as United States, Canada, Europe, Middle East and Africa. Elecworks continues to be available for SolidWorks customers in other areas (Asia pacific and Latin America) and is still globally marketed as elecworks™ for non-SolidWorks equipped customers or customers wishing to implement only 2D schematics design. Trace Software will keep on selling worldwide elecworks to electrical and automation engineering offices and to non SolidWorks users’ companies. “The 2D-3D integration of electrical design provided within SolidWorks Electrical offers our customers improved quality and decreased time-to-market,” said Fielder Hiss, Vice President of Product Management, SolidWorks. “This agreement is recognition of the high level of integration of our product with SolidWorks and the result of our commitment to offer the same benefits of working in 3D for electrical engineers” declares Dr Pedro Puig, General Manager, Trace Software International. Founded in 1989, Trace Software International provides design and management software solutions for the industrial automation and power distribution markets. Trace Software International has an outstanding track record of innovation and provides advanced customer-focused solutions. Partner to SolidWorks, Trace Software International is present worldwide and markets its product range through its subsidiaries, distribution channel and worldwide reseller networks. With a head office in France, Trace Software International has offices in Michigan (USA), Shanghai (China) and Barcelona (Spain). Its sister company TraceParts is a world expert in 3D Engineering Content, developing and marketing software solutions for CAD part libraries, electronic catalogs and product configurators. Dassault Systèmes SolidWorks Corp., a Dassault Systèmes S.A. subsidiary, is a world leader in 3D solutions that help millions of engineers and designers succeed through innovation. Our products deliver an intuitive experience in product design, simulation, publishing, data management, and environmental impact assessment. For the latest news, information, or an online demonstration, visit our Web site (www.3ds.com/solidworks) or call 1-800-693-9000 (outside of North America, call +1-781-810-5011). SolidWorks is a registered trademark of Dassault Systèmes SolidWorks Corporation in the US and other countries. Other brand and product names are trademarks of their respective owners. © 2012 Dassault Systèmes SolidWorks Corp.